Gift Card fraud may not be as widespread as credit card fraud. However, it is on the rise and has been in the news. A recent headline is the class action lawsuit filed against Walmart. * According to Brigette Honaker, Top Class Actions, the Walmart class action claims “the company refuses to compensate their customers after criminals steal gift card information and use the funds.” It also alleges Walmart “refuses to take steps to prevent fraud and gift card scams by securing their gift cards and checking for signs of manipulation at the time of purchase.” This litigation is certainly a wake-up call for merchants to protect their gift cards or be held accountable. Cybercriminals have capitalized on merchants prioritizing ease of purchase and profits over security. By offering a frictionless experience merchants have left themselves vulnerable to fraud. Furthermore, gift cards are not held to the same anti-fraud standards as credit and debit cards which leaves them more susceptible. Lastly, as gift card sales have shifted from plastic to digital, and in store to online, the fraud has shifted as well. 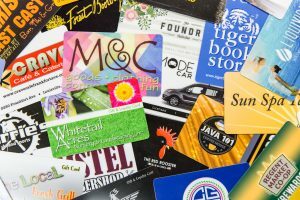 This article provides an overview of gift card fraud and ways to combat it. The major types of gift card fraud that occur in store are scratch off and return scams. Scratch off scams involve removing the scratch off covers over the pin numbers on the backs of cards, copying the card information, then applying new scratch off covers. The fraudsters receive alerts when the gift cards are activated via automated software that they set up to monitor online balance checkers. Then they drain the funds before recipients have a chance to redeem the gift cards. Retailers are moving away from scratch offs to combat this scheme. Merchants need to protect gift card numbers and store gift cards in more secure locations to make them less accessible. Return scams occur when people steal merchandise from stores then return it. The refunds are often given on gift cards. While this isn’t gift card fraud per se, gift cards are being utilized in this fraud scheme so it is worth noting. Most fraudsters skip the trips to stores and target online gift card balance checkers. Merchants sell either or both physical and digital gift cards online. Anna Westelius, Distil Networks, provides a description of the GiftGhostBot which gives an accurate account of how online gift card fraud is perpetrated. She stated “Fraudsters are using automation to test a rolling list of potential account numbers and requesting the balance. If the balance is provided, the bot operator knows that the account number exists and contains funds. Armed with that information, the account number can be used to purchase goods, or sold on the dark web for a fee. For a cyber thief, the beauty of stealing money from gift cards is that it is typically anonymous and untraceable once stolen.” Online balance checkers can be a weak link without security measures such as CAPTCHA, pin numbers and activity monitoring. Merchants should avoid using sequential numbering of gift cards as well. As gift card sales have steadily gravitated from plastic to digital, gift card fraud has followed suit. According to Paynxt360, the global digital gift card market is expected to reach $160 billion by 2020. Considering the entire gift card industry is expected to total $160 billion in 2018, the potential for digital gift card fraud is high. Already, an estimated $950 million was lost to e-gift card fraud in the year 2016, according to market size and fraud rates reported by CEB/Tower Group and ACI Worldwide. They reported that e-gift cards have the highest fraud attempt rates of all products sold by their merchants. The immediate delivery and ease of sale on secondary markets makes digital gift cards highly desirable. Digital gift card fraud is committed in several ways. E-gift cards are commonly purchased with stolen credit cards then sold on secondary markets. Also, cybercriminals do account takeovers where they get access to gift card accounts and quickly drain them of money. If the auto-load feature is enabled, a cybercriminal can quickly rack up charges and move money off the hacked gift card account.In 2015, it was disclosed that Starbucks customers endured this type of fraud. Account takeover attempts can be identified by tracking the number and rate of log-in attempts or when the billing information or email address is changed on an account. It is recommended that ISOs and merchants partner with a gift card provider like Factor4 that makes fraud prevention a priority, stays educated about the latest fraud trends, and provides the tools necessary to combat fraud. As gift card fraud evolves so must the gift card providers, ISOs, and merchants selling gift cards. Contact Factor4 at sales@factor4gift.com to learn more about our gift card fraud prevention tools. *The Walmart Gift Card Scam Class Action Lawsuit is McCoy v. Wal-Mart Stores East LP, et al., Case No. 6:18-cv-03256, in the U.S. District Court for the Western District of Missouri.